Mushrooms add a wonderful earthiness to dishes, and with the many varieties available, bring interesting texture, flavor, and appearance to a recipe. When cooking with mushrooms, however, your recipe may call for this ingredient sliced or chopped, measured in cups; but if you are purchasing whole mushrooms, how will you know how much to buy? Good thing is, with a few simple conversions, you will be able to determine how many whole mushrooms are in a cup of chopped, as well as several other equivalents. If you like mushrooms and tend to cook with them often, keep in mind you'll always have mushrooms on hand if you stock canned mushrooms, dried mushrooms, and powdered mushrooms in your pantry. Button mushrooms, or white mushrooms, are the most common mushroom available (and are actually named "common mushroom"). They are sold packaged whole or sliced, and sometimes chopped, often by the pound or less. As with many vegetables and fruits, purchasing them whole is more affordable than cut up. But if your recipe calls for a number of mushrooms or cups of sliced or chopped—or even cooked—you need to know how many pounds of whole mushrooms to buy. You may also realize your recipe requires dried mushrooms while you only have fresh. Some simple conversions will make mushroom recipes a breeze. Whether you have sliced fresh mushrooms or canned mushrooms on hand, knowing what the equivalent is for your recipe will save you a trip to the store. Stocking your pantry with dried or powdered mushrooms is quite a convenience when you decide to make a mushroom dish last minute. Dried mushrooms are reconstituted and plump up to resemble fresh mushrooms while mushroom powder is employed in recipes to contribute the taste without the mushrooms' somewhat chewy texture (ideal for picky eaters). 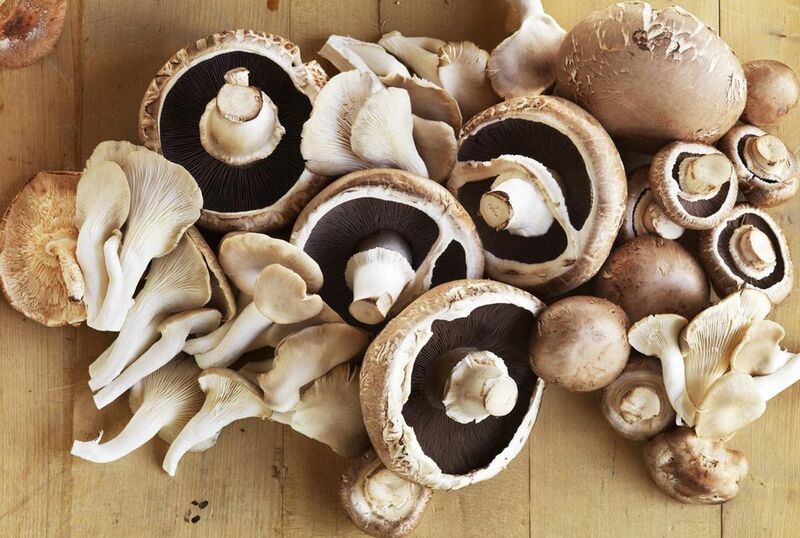 If a recipe lists fresh mushrooms, having the dried and powdered equivalents nearby will help you in a pinch. While canned, dried, and powdered mushrooms will last a long time in the pantry, fresh mushrooms will only stay for about 1 week in the refrigerator. Instead of keeping the fresh mushrooms in their packaging, place them in a brown paper bag and store on a shelf in the fridge, instead of the vegetable drawer where there is too much moisture. You can also freeze fresh mushrooms, but you do need to cook them beforehand.